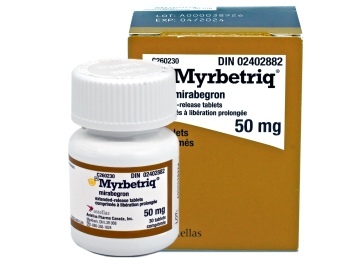 Myrbetriq (generic name Mirabegron) is used for the treatment of symptoms of an overactive bladder such as a sudden urge to empty the bladder (known as urgency), having to empty the bladder more than usual (known as urinary frequency), and not being able to control when you empty your bladder (known as urgency incontinence). Myrbetriq helps in reducing the symptoms of overactive bladder by relaxing the bladder smooth muscles. It also increases the bladder’s ability to store urine. If you are diagnosed with any of the above-mentioned symptoms, your doctor will discuss the most effective treatment for your particular condition. Canada Drugs Online is proud to serve you brand Myrbetriq from Canada manufactured by Astellas Pharma. Please call our toll free at 1-877-900-3784 for details. We also carry the brand Myrbetriq from United Kingdom manufactured by Astellas Pharma and the generic Mirabegron from India by Sun Pharma. CanadaDrugsOnline.com also carries other Urinary medications and Canadian drugs such as Actos and Motilium. As with any drug, there may be side effects from taking Myrbetriq. Some of the common side effects of Myrbetriq include increased blood pressure, dizziness, cold symptoms (nasopharyngitis), urinary tract infection, constipation, diarrhea, headache, nausea, and itching. Some uncommon side effects include rashes, hives, urinary retention (inability to empty your bladder), rapid and irregular heartbeat, and stroke. Rare side effects of Myrbetriq include angioedema (swelling of the face or tongue, difficulty breathing. If you experience any side effects (including the ones not listed here), stop taking the medication and seek medical attention immediately. You should follow the instructions of the doctor who prescribed Myrbetriq to you. Directions and dosage information can also be found on the pack or leaflet inside the pack. Brand Myrbetriq comes as tablet in the dosage form of 25 mg, and 50 mg. The usual start dose is 25 mg. The medication can be taken with or without food. The tablet should be swallowed as a whole with a glass of water without crushing or chewing it. The maximum daily dose for Myrbetriq is 50 mg once daily. Myrbetriq medication should be stored at a temperature of 25°C with excursions permitted between 15°C and 30°C. It should be kept out of sight and reach of children. If you are allergic to any of the ingredients of Myrbetriq, you should avoid taking it and inform your doctor. You should also not take Myrbetriq and consult your doctor, if you have very high uncontrolled blood pressure, are pregnant or breastfeeding. Also, tell your doctor before taking the medication, if you have problems emptying your bladder or have a weak urine stream, are pregnant or trying to become pregnant, are breastfeeding or planning to breastfeed, have a severe liver disease, severe kidney problems, an eye problem called glaucoma (increased eye pressure), high blood pressure or a history of high blood pressure, any heart disease including irregular heartbeat, an abnormal electrical signal in the heart known as "QT interval prolongation" or a history of QT interval prolongation, a history of the ischemic disease, a heart rate that is higher than normal. You must consult your doctor if you are taking any other medications as they may interact with Myrbetriq, including propafenone or flecainide (medicines used to treat irregular heartbeats), digoxin, drugs used to increase heartbeat or increase blood pressure such as anticholinergics, drugs that are known to prolong the QT interval such as antipsychotics, antidepressants, antibiotics, and antifungals, ketoconazole (an antifungal drug), metoprolol (used to treat high blood pressure), and desipramine (an antidepressant).